People in glass offices should probably watch where they’re going. Collisions have been one very clear downside of Apple’s $427 million spaceship office in Cupertino. There’s a definite downside to glass walls in a setting where occupants are regularly staring down at their phones. In an effort to combat the phenomenon, some have taken to sticking Post-Its on potential hazard zones — a sort of primitive form of augmented reality. Likely these reports won’t result in a black eye for the company. People in glass offices should probably watch where they’re going. 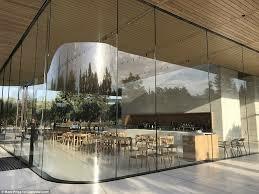 Collisions have been one very clear downside of Apple’s $427 million spaceship office in Cupertino, according to a story out of Bloomberg. The “people familiar with the incidents” won’t say how widespread a phenomenon all of this is, but there’s a definite potential downside to glass walls in a setting where occupants are regularly staring down at their phones. In an effort to combat the phenomenon, some have apparently taken to sticking Post-Its on potential hazard zones — a sort of primitive form of augmented reality. As someone who regularly runs into stuff, I can personally confirm that walls, not people are to blame in this situation, and likely the whole things is more a source of brief personal embarrassment for those involved. As the story points out, none of the impacts have warranted a post to the Occupational Safety and Health Administration. Transparency, after all, is the key to addressing these issues. Likely these reports, however, won’t result in a black eye for the company.